Embossing is an elegant process that changes the nature of the material that has been embossed. More often than not it elevates the standard and quality of the product. A notary’s embossed seal can give much weight to a regular piece of paper. Similarly, an embossed wedding card immediately changes the entire meaning conveyed by the invitation. The recipient is informed not only about the wedding but also that it is going to be a high profile wedding and an elegant ceremony. 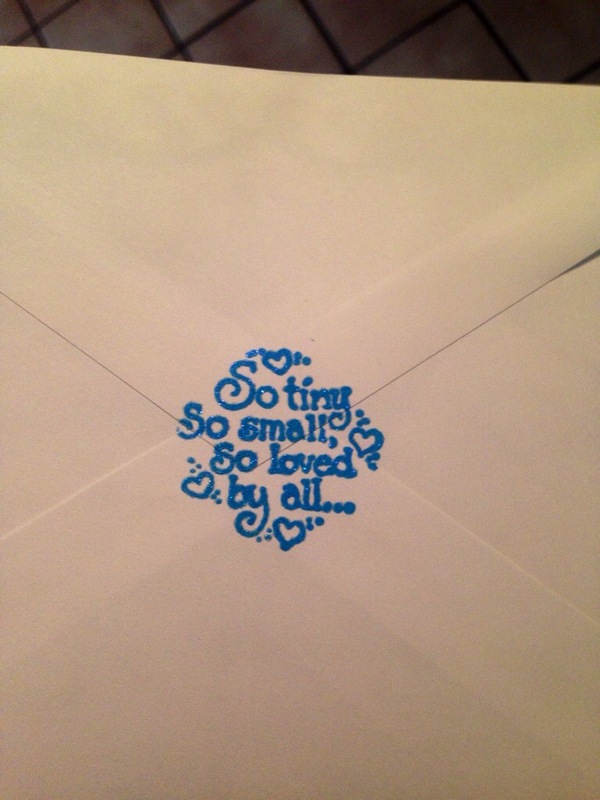 We decided to seal the envelopes closed with the adorable stamp with blue ink and iridescent glitter. It’s a simple touch that we can now incorporate into the shower. We can emboss the stamp on the thank you notes, on gift tags, center pieces, the possibilities are endless! Contact us today if you want to know more about our custom invitation services or embossing! This entry was posted in Custom Invitations, Serendipity News! and tagged baby, baby shower, custom invitations, embossing, engagement, event planning, invitations, mom to be, northern ohio, serendipity weddings and events, southeastern michigan, wedding. Bookmark the permalink.